…As IAEA head [Mohammed] Elbaradei shielded Iran’s nuclear weapons program from the Security Council. His actions won him the support of the Iranian regime which he continues to defend. Just last week he dismissed the threat of a nuclear armed Iran, telling the Austrian News Agency, “There’s a lot of hype in this debate,” and asserting that the discredited 2007 US National Intelligence Estimate that claimed Iran abandoned its nuclear weapons program in 2003 remains accurate. 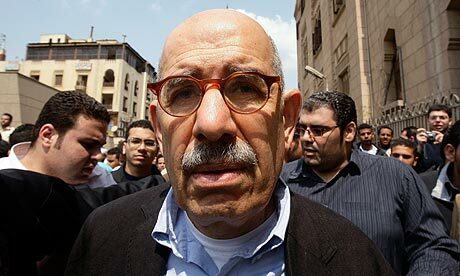 Elbaradei’s support for the Iranian ayatollahs is matched by his support for the Muslim Brotherhood. This group, which forms the largest and best-organized opposition movement to the Mubarak regime, is the progenitor of Hamas and al-Qaida. It seeks Egypt’s transformation into an Islamic regime that will stand at the forefront of the global jihad. In recent years, the Muslim Brotherhood has been increasingly drawn into the Iranian nexus along with Hamas. Muslim Brotherhood attorneys represented Hizbullah terrorists arrested in Egypt in 2009 for plotting to conduct spectacular attacks aimed at destroying the regime. Partially in a bid to placate its opponents and partially in a bid to check Israeli power, Egypt has been the undisputed leader of the political war against Israel raging at international arenas throughout the world. So, too, Mubarak has permitted and even encouraged massive anti- Semitism throughout Egyptian society.